A woman's children write a shocking obituary in her remembrance. Growing up, it's inevitable to have a few spats here and there with your parents. They make mistakes and we, their kids, do as well. Have you ever taken one of their mistakes to heart? 80 year-old Kathleen Dehmlow passed away on May 31st of this year in Springfield, Minnesota. You're probably wondering: why is this news? Because of the obituary left in her memory. Dehmlow, in 1957, married her husband Dennis and they had two kids - Gina and Jay. After five years of marriage, Dehmlow became impregnated by her husband's brother, Lyle, and moved to California with him, abandoning Gina and Jay who were then raised by her parents. 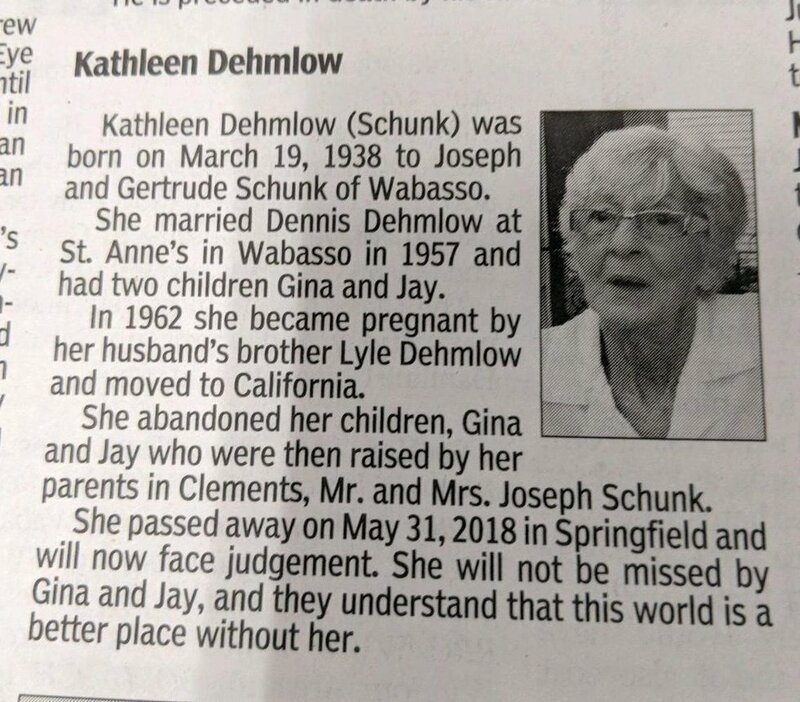 Obviously still upset with their mother for leaving them, Gina and Jay wrote quite a nasty obituary in her remembrance. In the photo shown below, Gina and Jay started off the first two lines well. The third line and the ones following are where it all went downhill. When the memorial blew up on the internet, it was removed almost immediately. Dwight Dehmlow, a relative, said that "there is a lot of stuff missing from the obituary." He also went on to say that "she made a mistake 60 years ago, but who hasn't? Has she regretted it over the years? Yes." Some took to the internet and commented on the obituary, leaving "well-wishes" for the deceased.